I love love LOVE when my friends come to write for my blog. It makes me all kinds of happy. Today's guest blogger is the delightful Casey from Little Lifelong Learners. She had I have so much in common. We're teacher mummas, passionate about all things early learning and we each have a girl and a boy (roughly the same age). 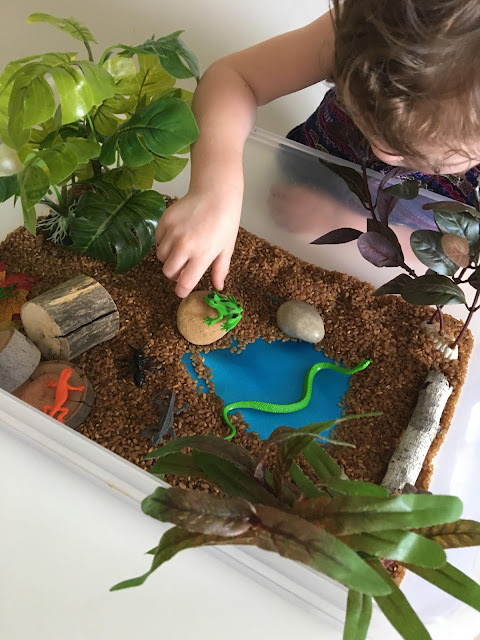 She has a beautiful Instagram feed, fantastic printables on her website and TODAY she releases her "Sensory Play for your little learners" ebook to the world! Is there anything this teacher mumma can't do? To celebrate the launch her her book, she's sharing an awesome creepy crawly small world play idea. I can't wait to try this one out myself! Small World Play is such an important part of early childhood development and it has numerous benefits for Little Learners. Your child will develop their creativity and imaginative thinking as they create story lines and scenes. Oral language skills will also be developed as they role-play and narrate their thinking. Small World Play is also a wonderful way to initiate and encourage independent play. It’s also a whole bunch of fun to set up a small world invitation for your children and today I’d like to share a fun creepy crawly small world for sensory play! First you’ll need to make a batch of dyed rice for the dirt. To dye the rice, you’ll need a bottle of Parisian Essence which you can find in the baking aisle at the supermarket; a packet of long grain rice; and a container with a lid for mixing. Place the rice into the container and add a splash of the essence to the rice. Shake it around until all of the rice is coated. You may need to add more essence to get the desired shade of brown. You can also add a little bit of vinegar to help the colour stick. Once you’ve got the right shade of brown, lay the dyed rice out on some baking paper and leave it in the sun to dry. Next you can add the rice to a shallow tub ready for your small world. Creepy crawly toys (I love the small tubes from Kmart). When I set up a small world invitation, I like to start placing the larger objects down first. For this tub, I organised the logs and plants first and then scattered the smaller items around afterwards. Alternatively, you can get your Little Learners to help find suitable objects and have them set up the small world themselves! My genius of a husband likes to set up his phone with it playing suitable relaxation music to encourage creative play. This week, we set up a magical fairy garden so he found some rainforest music to play. We’ve also used beach sounds for a pirate small world. This is a great way to add a sensory element to your small world play! As you can see, it’s so simple to set up a small world invitation for your Little Learners using items you already have around the house, the supermarket and your local dollar stores. Your children will love using their imagination to create and explore as they play! To extend the activity, you can print off this FREE creepy crawly sight word book! Simply print the page and have your Little Learner colour in the pictures. While you’re colouring, you can talk about the different creepy crawlies featured in the book to further develop their vocabulary and oral language skills. Depending on their age, they can cut along the lines (or you can cut for them) and then assemble the pages into a book. You can then staple the pages for a mini sight word book all about creepy crawlies! 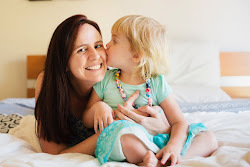 Casey is a primary school teacher turned stay-at-home mama and she posts play and learning inspiration on her website, Little Lifelong Learners. Today she has launched her first eBook, Sensory Play for your Little Learners. Head on over to her website to grab your own copy! You can also follow Little Lifelong Learners on Instagram and Pinterest for more fun ideas for play and learning! I was lucky enough to get a sneak peek at her book before launch day, and I was so impressed! It's set out really clearly - one activity per double page (and there are 50 activity ideas all together so that's plenty to keep your kids busy). Casey has carefully considered the needs of different aged babies and toddlers, but I can imagine Miss M (who's nearly 4) having fun with lots of the ideas. Her photographs in the book are light, bright and beautiful and capture the essence of the play experience. The activities aren't too complex and do not require many materials to be purchased - some you probably have around the home already. Bottom line is sensory play is such a crucial part of a child's holistic development and Casey's book is a fantastic resource. I adore this small world play. Such a simple set up and something my girls would play with for hours. Thanks for your sharing. This game is very rewarding and stimulating children's creativity. I think my baby will love it.